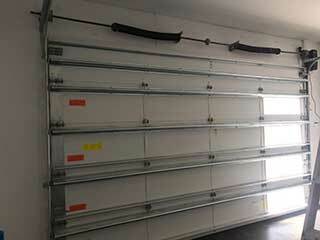 Garage door springs are an essential part of any automatic or manual overhead door system. They are the components that support the weight of the panels and help the door move by providing it with tension-based force. When their condition deteriorates, their performance will grow less and less efficient, until they will eventually break. This time of situation can be incredibly dangerous, which is why you should let an expert handle any spring adjustment or replacement task. Not every door uses the same springs. A heavier door, or one that's installed in a garage with very little backroom, will require a torsion spring. Components of this type are installed above the door, parallel to its length, across a metal rod. This rod is attached with cables which rotate it as the door closes and cause the spring to twist up and become loaded with tension. When the door opens the spring unwinds and the tension helps the door move. The second type is the extension springs, which are installed in pairs, one on each side of the door. They extend as the door closes, and contract in order to help it open. Due to the way they work, they are far more likely to whip around and go flying when they break, and therefore they are often interlaced with safety cables that help keep them in place when something like that happens. Even the strongest of springs will gradually suffer from wear and tear damage over time. This is because the stress of their job puts these components under immense and constant pressure. Rust is another factor that can greatly reduce their lifespan, and even galvanized springs can develop galvanic corrosion and become damaged. Replacing a broken spring is dangerous enough, but even minor tasks can be risky if you don't have the right tools and the necessary training. With a little routine maintenance, you can ensure that your springs enjoy a longer and more functional lifespan. If it's been some time since you last had these crucial components serviced, be sure to have one of our technicians take a look at them for you. We'll check to make sure their coils haven't become deformed, apply them with the right lubricant to keep them efficient and adjust their tension as necessary to make sure your door doesn't get unbalanced. Our team at Garage Door Repair Loganville can help you deal with any spring related issue you may have. If your old components are about to break, it would be better to get them replaced in due time than to risk them breaking unexpectedly. Call us whenever you need assistance.